The 535Q gives unprecedented control. With the ability to select one of six wah ranges, a Q knob, a volume knob and a boost button, this pedal has almost anything you could want in terms of manipulation of the wah’s parameters. The layout can get kind of confusing, at it can be very difficult to tell which if the six range settings you are in and which you are switching to. 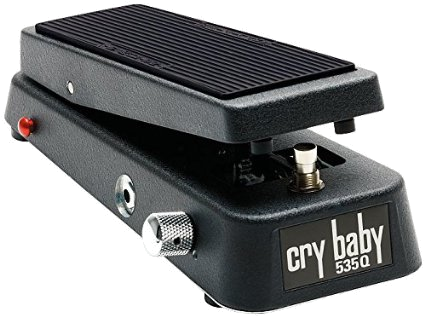 Because of its unique controls, this is one of the most versatile wah pedals available. With its many parameters, this pedal is especially good at allowing you to find the tone you are looking for. Unlike many other pedals of this type, you are not stuck with the one setting. This makes it so the user can actually manipulate their tone, and not sacrifice sonic integrity every time they want that funky sound. This pedal, like many wahs, can have some serious feedback issues. That can be counteracted be careful selection of the frequency range and the Q settings. Its combination of classic wah functionality and tonal manipulation make this a wonderful addition to your pedalboard.